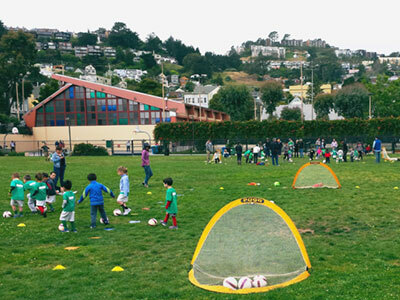 Free Drop-in Volleyball (18 and over) has expanded to Friday nights 6:30 - 8:30 p.m.
On Sunday, April 26 Bom Dia Market, at the corner of 29th Street and Sanchez, will fund-raise for Upper Noe Recreation Center as part of a neighborhood spring celebration. Food and entertainment are compliments of Bom Dia. Just bring your friends and family to discover this fabulous new corner store and enjoy an afternoon of festivities, tastings, and prizes. Passione Pizza will be out front offering up slices and samples of melty, cheesy, delicious pizza from their food truck! 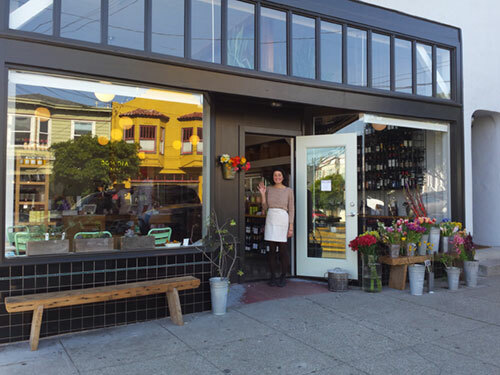 Festivities run from 1 p.m. to 6 p.m. but Bom Dia Market is open from 7 a.m. to 9 p.m. and 10% of all purchases made all day go to support Upper Noe Recreation Center. Bom Dia means “Good day” in Portuguese. Come out, support new neighbors and old, and enjoy some delicious treats on Sunday, April 26. What a good day that will be. On May 9th at 10 a.m., the Ladybug Gardeners will host an educational tour to showcase low-impact gardening featuring drought-resistant California natives in the Native Plant Garden and our new Succulent Garden thriving on little or no irrigation. Local gardening experts will be on hand to point out various species and explain their benefits and contributions to the environment. Learn how to plant water-smart. Currently, our lush garden of natives is in its element. The drought seems to affect them not a bit. 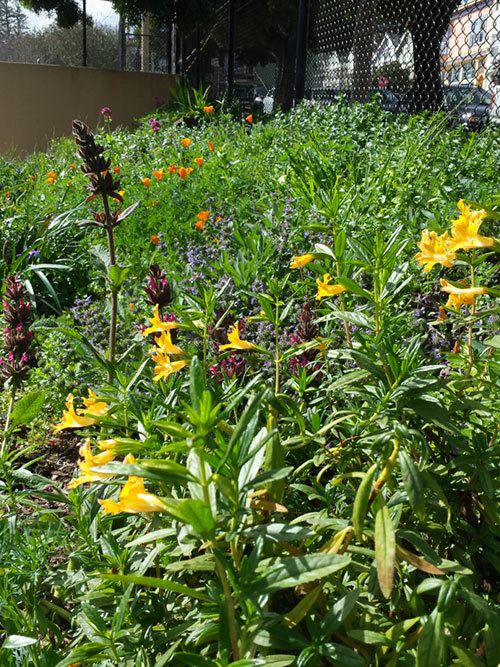 Ladybug leader Joan Lionberger commented, "The Native Plant Garden is alive with butterflies and honey bees and flowers.” More than a half dozen species are in bloom from bright orange California Poppies to red Hummingbird Sage to lacey Sonoma White Yarrow. Come out and see this colorful collection along the Sanchez Street side of the building. The tour is in conjunction with the quarterly Ladybug Gardener workday, from 9 a.m. to noon. Volunteers are appreciated. Says Joan, “We still have the Blue Bird Garden and the Native Plant Garden to work on. Just a little work and our park looks inviting to the kids, big and small. It is a great way to get to know the park and your neighbors. Registration for Summer Activities begins at 10 a.m. on Saturday, May 16. Register in person at the Rec Center or go to www.sfreconline.org . Come on down and sign up for classes and enjoy live music in the playground. There is no drought of soccer enthusiasts at Upper Noe. While a dearth of water stretches across our state, the need for green spaces persists. Lack of rain over the winter caused Rec & Park to suspend plans to close and refurbish the field this year; the weather was just too beautiful to deny visitors the use of it. While RPD made huge cuts to water use on the hardscape, no plans are in place to reduce the sprinkling necessary to keep the field playable. Bom Dia Market at 29th Street and Sanchez will be donating 10% of proceeds all day to the Upper Noe Recreation Center. Come out and support new neighbors and old. They will be giving away samples and treats. Drought Awareness Tour at 10 a.m. - come see our Native Plant Garden and our new Succulents gardens thriving on little or no irrigation. Learn how to plant water-smart. Meet outside by the playground. In-person sign-ups and assistance at the Rec Center. Choose classes and enjoy live music in the playground. • Garden at the Park. Help keep the park beautiful by volunteering with the Ladybug Gardeners on the second Saturday of each quarter. The next date in 2015 will be May 9. All ages welcome, no experience necessary, community service hours credited. Even an hour would be a big help! Please email ladybugs (at) noevalleyreccenter.com.